The slope of the saturation curve of a working fluid in a T-s diagram can be positive (e.g. isopentane), negative (e.g. R22) or vertical (e.g. R11), and the fluids are accordingly called ‘‘wet’’, ‘‘dry’’ and ‘‘isentropic’’ fluids. Wet fluids usually need to be superheated to avoid liquid droplet impingent in the turbine blades during the expansion. 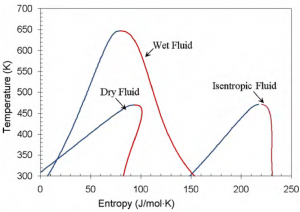 Dry or isentropic fluids do not need superheating. for turbine expansion safety and improvement of the cycle efficiency. High latent heat, high density and low liquid specific heat are preferable. Fluid with high latent heat and density absorb more energy from the source in the evaporator therefore giving higher turbine work output compared to a low latent heat and density fluids. This helps to reduce the required flow rate, size of the facility/equipment, and pump consumption. and decomposition at high temperatures. The maximum operating temperature is thus limited by the chemical stability of the working fluid. Additionally, the working fluid should be noncorrosive and compatible with engine materials and lubricating oil. And in terms of environmental and safety aspects, as mentioned above, fluids with high latent heat, high density and low liquid specific heat are preferable because they absorb more energy. And that’s in the end what we want, isn’t it?